I oversee Cooperative Extension programs in Fresno and Madera County. Although I began my career as an agronomy farm advisor, it looks like I will retire an administrator. I've enjoyed becoming more familiar with the other CE programs, like nutrition and 4-H. It has given me a greater appreciation for all we do to benefit the residents of each County and our extended audience throughout California, the US, and in many cases, the world. It isn't easy to choose! 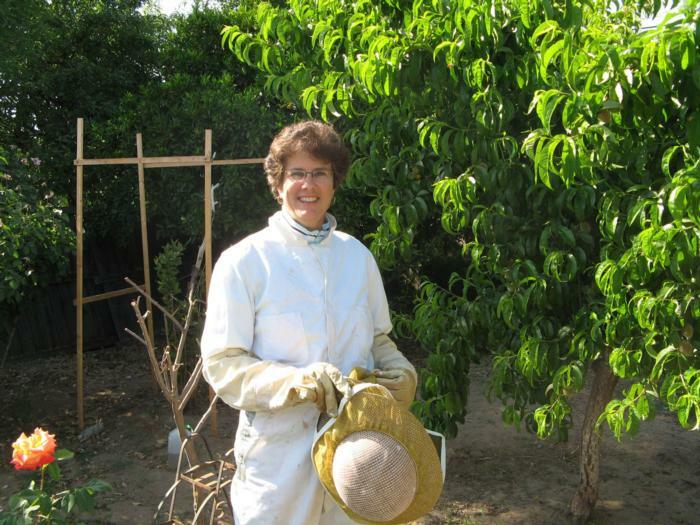 Many memorable moments are related to the work I've been doing with bees and beekeepers. I've conducted research with honey bees and leafcutting bees, taught classes for beginning beekeepers and apiary inspectors, developed an online training covering honey bees and colony strength assessment, travelled to other countries to talk about bees and pollination, kept several colonies of bees with UCCE friends, and shared my enthusiasm for this important pollinator with many school children and adult audiences. Learning about and working with bees has been a wonderful part of my job and I plan to continue keeping bees with my UCCE Bee Buddies when I retire. I love that it is never the same two days in a row. I always enjoyed being out in the field and working with growers and allied industry representatives. They were so open and readily shared information about their operations and the industry in general. I appreciated that they allowed me to conduct research in their fields and taught me what years of experience had taught them. Their generosity in sharing information and resources made me a much better farm advisor. When I was in graduate school at Cornell, my father set up an appointment for me to meet with Carol Frate, farm advisor in Tulare County, while I was home for the holidays. When she described her job, I immediately decided - That's what I want to do! Just as I was graduating, a position opened in Fresno County and I was lucky enough to be offered the job. It has been wonderful to work with Carol over the years, especially since she is the reason I came to Cooperative Extension. She was a great mentor, role model, and colleague. We worked together on many research and educational efforts through the years. The strong network of farm advisors throughout California is what makes CE such a wonderful place to work.